Thanks to Michelle Obama and Jamie Oliver, everybody is talking about fat kids and what government can be doing differently. Fatty school lunches, the need for exercise programs, the possibility of a soda tax, and the creation of food awareness classes are all on the table The discussion has gone beyond fat kids to talking about fat adults. The New York Times magazine issue this weekend was devoted to the topic of health. Marc Ambinder had a fabulous cover article in Atlantic Monthly about his battles with obesity and policy proposals for reducing the wiggle and jiggle in kid's bellies. Also, I've started running again. I ran my second 5K race this weekend. I've been spending more time cooking better meals. So, I'm completely inundated with information and experiences about public health. I'll come back to the details of the articles later. First, I just want to talk about the politics of public health policy. Libertarians are generally suspicious of all public policy, because they reject the notion that government can make a positive impact on people's lives. The less government, the better. When government gets involved in people's lives, the outcome is usually expensive and results in unexpected outcomes. Welfare creates dependency, for example. Libertarians especially hate governmental programs that push people to change their behavior regarding their health. For all but a radical fringe, they accept mandatory vaccinations for kids, but they aren't enthusiastic about other programs, which restrict a person's individual freedom to kill himself. I have a Big Mac, and I'm going to eat it. Efforts to reduce smoking and the availability to fast food is beyond the scope of government. They say that when government wades into these matters, it becomes a "nanny state" and adults should be able to make their own decisions about the Big Mac v. Tofu. Liberals, on the other hand, say that obesity is expensive. Obesity-related diseases cost the public billions of dollars in healthcare costs. People don't really have the choice of a Big Mac v. Tofu, because tofu isn't available to most people and they don't know how to cook it. The Big Mac is cheaper than a good salad. The current system is rigged to make the Big Mac the most popular option and that isn't fair. Let's give people some real choices and, thus, increase their freedoms. Liberals also say that children can't make the same choices as adults. They need guidance. If the parents and the community can't provide them with better options, then government must step in to help out. It's immoral to allow this generation of children to fill themselves up on Slurpies and candy bars. Government can do better. fillets, Swiss and pepper jack cheese, Colonel sauce, and bacon. 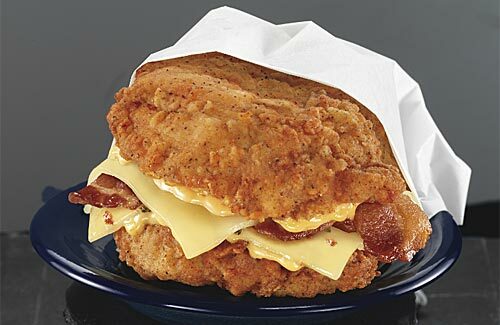 You can also get the Double Down with grill chicken fillets. For the health benefits. People don’t really have the choice of a Big Mac v. Tofu, because tofu isn’t available to most people and they don’t know how to cook it. The Big Mac is cheaper than a good salad. The current system is rigged to make the Big Mac the most popular option and that isn’t fair. Let’s give people some real choices and, thus, increase their freedoms. As succinct an expression of the principle of “positive freedom” as I’ve ever read. Obesity-related diseases cost the public billions of dollars in healthcare costs. I like the rule, which I may have heard here, that you should only eat things your grandmother would recognize as food. She wouldn’t have recognize tofu. How about trying to get people to eat some carrots and beans with the meat? I love KFC almost as much as my children and even I found that sandwich a bit disturbing. They’ve had some questionable offerings over the years. I can’t help but notice that there’s been a lot of official diet advice that is actually harmful, or super politicized. Is it a coincidence that the bottom, largest tier of the food pyramid (grains) is also one that gets huge amounts of subsidies and market support? (I’ve heard that the prominence of dairy in the old food group scheme was likewise a political thing.) If you look back, there are all sorts of unfortunate health ideas that have been foisted on the public over the years: the demonization of sugar and the rise of corn syrup, anti-egg animus, the demonization of saturated fat in favor of hydrogenized oils, “low-fat” versions of foods that encourage people to eat larger portions, etc. The current food mania in favor of fresh plant food seems harmless compared to previous fashions, but it’s naive to expect that the results will be any better than past campaigns. For one thing, there are some odd dynamics at work. Remember that study about how diet soda was more linked to obesity than regular? The rise of corn syrup didn’t have much to do with health policy, though it was government policy. No government entity was saying “eat more corn syrup!” but doesn’t the rise of corn syrup go hand-in-hand with official urgings to consume less sugar? Some years back, I certainly remember seeing a lot of “no sugar added” labels on food which, if you looked at the ingredients, contained corn syrup very high in the list. but doesn’t the rise of corn syrup go hand-in-hand with official urgings to consume less sugar? I’m sure there is some of that, but it’s got much more to do with farm policy. Sugar is more expensive because of a tariff placed largely to protect the few domestic growers of sugar cane/beets and domestic corn growers. It’s an “Iowa votes early, Florida is a swing state” thing. As I understand the corn syrup thing, from reading Michael Pollan and watching Food, Inc. is that the consumption of corn syrup was driven by its low price, which was in turn artificially created by corn subsidies imposed by the government. So processed foods especially turned to using corn syrup in their products rather than sugar, which is, as MH points out, priced artificially higher. On tofu, have you all seen the news about toxic chemicals in veggie burgers? Well, it turns out that even the so-called “good guys” of the food industry use some nasty stuff to process their products. I’m moving to the country, planting a garden and raising some pigs and chickens . . . I have to say that while I am in favor of policy that increases availability of healthy food (in, say, elementary schools) most of the health food policy I’ve seen has been aimed at restriction, and often in counterproductive or trendy ways, like the bake sale ban that made home-baked cupcakes illegal but 100-calorie oreo packs fine and dandy. If you want people to eat real food making junk food into a fetish item is not the way to achieve it. I also find the disgust aimed at the fat and salt in fast food, from people who don’t have any idea how much sodium and fat is in classy restaurant food, to be kind of distasteful and classist. No, I don’t want to eat that KFC sandwich but let’s not go pretending your foie gras appetizer and that bread basket you gobbled up don’t have about as many calories. And I continue to think the obesity epidemic has more to do with restricted activity and the giant drinks every American needs to carry around than with candy and chips, which were very much available when I was a kid. I keep hearing that argument, and since I haven’t read Pollan*, I don’t understand the full of it and could certainly be convinced that it is true. However, I find it hard to believe that the government is lowering the price of any corn product in the aggregate over the long term. Over the years, they have paid farmers not to grow corn, required huge portions of the crop to go to ethanol, and generally pushed exports of as much as possible. Lowering the price relative to sugar, that’s easy to see. What the price of corn would be minus government intervetion is a bit more difficult for me to understand. *We actually have the book around the house, so I suppose I could read it. MH, here’s a reasonable summary of the argument, including a study to find out how true the argument is. It’s complicated is the answer. It’s complicated is the answer. I started following the reference links and boy is it ever. But, I didn’t know that the production caps were removed in the 90s (probably because that’s when I lost daily contact with corn farmers). In regard to the “your grandmother recognizes as food” concept: this fails when you move people and foods into different cultures. My husband’s grandmother most definitely knows tofu: her parents came from Hong Kong and she’s lived in Hawaii her whole life. Tofu is a key food staple in her life. Does my husband then get to eat tofu while I don’t? As oliviacw points out, I presume you’re only speaking of your own grandmother, and not anyone else’s. I encounter this with respect to vegetarianism (though I feel differently about vegan eating, which I don’t believe has a good cultural reference). Mind you, I’m pretty sure that no grandmother saw a tofurkey, and I’m not a fan of reprocessing food to look like meat. Indeed a scary sandwich. Meat stuffed with meat has always bugged me too. Does my husband then get to eat tofu while I don’t? You and your husband can eat what you want. Knock yourselves out. If you are at KFC, I’d stick to the regular chicken in a bucket, but that’s just my advice. As oliviacw points out, I presume you’re only speaking of your own grandmother, and not anyone else’s. Sure, but it’s bound to be harder to get people to eat healthier at the same time you are trying to get them eating food from a different culture. There’s a whole different set of tastes. It is my very strong supposition that part of the reason public health campaigns fail at producing better eating habits is because they try telling people things like “tofu is good.” If somebody who wasn’t raised on tofu manages to get paste the pasty, squishy appearance and eat some, they are going to be very slow to believe that food can be healthy and good tasting. Hey, tofu is awesome if you deep-fry it. But, then, you don’t get the protein. I, incidentally, feel the same way about chicken and ground beef. I don’t believe in “substitute” foods, foods that are masquerading as something else. That’s my “would your grandmother recognize” it test. I also really don’t get foie gras. I also really don’t get foie gras. I’ve only tried it once and I can’t say I enjoyed it. It was like goose-flavored butter. I only ordered it because somebody was protesting local restuarants that served it. Actually, goose-flavored shortening. Goose-flavored butter sounds delicious. I love foie gras and practically everything else made with liver. Chicken livers are the world’s last great cheap luxury food. What about all those bizarro kosher foods like kosher chicken kiev, made with margarine, or all the other crap with pseudo-dairy that Orthodox jews and vegans eat? Kosher certification has become a sort of mafia-run fake food industry. We actually had a discussion about this at the seder table this year, and my friend who’s more tuned into organized Judaism says that locavorism and humane kosher slaughtering have begun to challenge the kashrut authorities. Chicken livers are the world’s last great cheap luxury food. My cat agrees- it’s his favorite, and actually not much, maybe less, expensive than canned cat food. It’s a bit more annoying to prepare, though, as it has to be cut up into little pieces or he really makes a mess. We will sometimes eat it, too, but only if it’s really fresh. If you can go to a good Korean restaurant and get fried tofu you’ll find something good. I doubt it’s terribly healthy after being fried, but I just don’t care that much about such things. And that “Grandmother” rule is just dumb, even as a rule of thumb. And that “Grandmother” rule is just dumb, even as a rule of thumb. I think the idea was to have a broadly understood way of indicating what is an overly-processed food. Right. Whereas if you had a good look at people’s respective food traditions, you could do quite a lot with foods that they recognize as part of their heritage, but which have fallen out of daily consumption in the move to the city or suburbs (I know you Italian folk keep your food traditions in the city, but that’s uncommon). And the way to reintroduce those foods might be through better and more processed foods, rather than expecting everybody to cook, because they’re not going to do it. Yes, I remember hearing some Asian-American friends back in college discussing the oddity of Americans attempting to eat tofu without cooking it first. Personally, I think Thai panang curry with tofu is incredible, but that definitely involves frying the tofu. I have to run off, but I’d like to quickly mention that class is important here. I don’t feed my kids Velveeta and the reason is that my mental image of myself is that I am not the sort of person who would do that sort of thing (although I grew up on the stuff). Anyway, I suspect that a lot of the food issues do have a strong class dynamic, so that one of the reasons that people are willing to work so hard on this stuff is as a way of drawing a line between themselves and the lower orders. If, by some miracle, the “lower orders” were to eschew fast food and start eating micro greens, the goal posts would need to be moved again. I know that, of course, but it’s dumb because, even if we get beyond the issues noted above, it does even this much pretty imperfectly (My grandmother would have recognized filled milk as food, and most people today wouldn’t, for example) but more so because it’s just wildly over and under inclusive as to health. But it’s the sort of simple-minded garbage that food writers think are deep and useful. How do we know you aren’t in the pay of the giant “cheese in a spray can” people? Personally, I love very fresh soft tofu (either cold with bonito flakes and a soy-based sauce., or boiled hot in a simple broth), but I can’t seem to get it in this country except at very expensive Japanese restaurants. Maybe I need to learn to make my own. But what tastes good to you varies so much, I’m not going to push it upon anyone. And I agree with “what is up with Tofukery.” Or vegan cheese. If you crave cheese, why eat vegan? That sort of thing I don’t understand. But that just underlines that what’s good for you, what’s the necessary change in your diet to make, depends on your circumstances. For all that poor-and-fat is today’s problem, since the problem when and where my dad was growing up was poor-and-starving, he much prefers obese America. Why do I only buy cage free eggs? 10 years ago I was in the Cowley Road Tesco (just down the road from my old secondary school) and an elderly woman walked up to me and asked where the free range eggs were. I recognized her as a dinner lady from my school (but didn’t say anything). I reached up and got them for her, and she went into a brief discussion of how cruel it was to cage chickens up. I don’t even care about chickens, but I’ve bought cage free ever since. If its good enough for her. Another memory. I first had smoked salmon when I was 21. It was posh food, something that children of my class never had, and our parents only ever had when they went to very fancy “do”s. Indeed, I was at a fancy do with my dad and my uncle when I first had it. I remember that amazing burst of flavour, like nothing I’d ever had before in my life, and the thought “wow, this is fantastic. They really do keep the best stuff for themselves”. So I have a completely different view of the class dynamic. When I hear people saying that it is elitist to talk about food there’s always a voice in the back of my head telling me “there we go again, the rich trying to keep the good stuff for themselves. Much better to have the working class kids obese, so that they can’t compete with ours for grades and college”. Yes, but does that mean everything the upper classes like is always better? There was a time in history when garlic was considered desperately low-class and all the best people bathed their food in white sauce. and yet there have been several studies suggesting limiting sodium only decreases blood pressure in a select population of salt-sensitive people. I guess the rest of us will have to suffer. No, certainly they make mistakes, and lots of this stuff is socially constructed. Not soda, not smoked salmon, though. I’ve grown up eating smoked salmon whenever I could get it, because I grew up in an area where people would catch salmon and smoke it themselves. The usual store stuff really isn’t any good, in my opinion. I wouldn’t exactly call smoked salmon a health food, though, or something to eat in significant quantities. Sometimes it’s better to miss out on upper class pastimes–take dueling and foot-binding, for instance. That is an interesting issue. Back in the day, eating like an upper-class English person would get you a raging case of gout. Likewise, I have a vegetarian friend just back from a couple years in a North African country, and she says that the local elite in the country where she was living eats themselves to death on huge quantities of meat, whereas the diet lower down the economic scale is much more balanced. One country’s exotic delicacy is often another’s rustic home cooking. I’m supposed to be on the watch for Polish smoked sheep cheese (oscypek) and quail eggs for my husband. Again, absolutely better to avoid footbinding (and prepubescent forced marriage). But not health, longevity, and high quality education. Um. I’m curious what the mortality statistics are in that country. I don’t know of a country where lower status people outlive higher status people. The class character of gout has much more to do with the fact that onset is usually in mid-late middle age than diet — until the 20th century you had to be upper class to expect to live long enough to get gout. I don’t know the local specifics. Probably the local elite in that country would do best of all with a combination of a lower-class diet and the better medical care that they currently enjoy. Gout is very diet-based. You get it from not drinking enough water and consuming too much alcohol, meat and fish. Unless you’re at least somewhat well off, you won’t eat expensively enough to get it. I know much more about gout than I want to, I promise you. I am vegetarian, very close to teetotal, and drink about 8 pints of water a day. My condition came on early (late twenties). If you have gout, changing your diet can slightly lower the frequency and intensity of attacks, but I promise you, it cannot do away with it. And one of the main enemies is complete proteins — so a diet of beans and grains, for example (the diet of the poor of the world), is something not to overindulge in. Now I followed your link, which I assumed from your description was quackery, but in fact it is reasonably accurate. Saying that altering your diet can help you manage the condition is very different from saying the condition is diet-based. It’s not. You poor guy. I suggest a nice ottoman and a cane for whacking anyone who comes near your afflicted limb (I forget what book has a character who does that). Steve feels your pain, harry. He ended up in the emergency room a few years ago, because of the gout. It runs in his family. How did we get diverted by gout? And Ragtime. I didn’t ignore you, it just took me longer than 2 minutes to write the comment. Gout certainly seems to have gotten a lot less prevalent than it used to be. I get the feeling from 19th century English lit that a middle aged man was just expected to get the gout at a certain point. Amy, I don’t think it was ever that common. To watch TV, you’d think everyone was California was blond and lived within 500 yards of the beach. And you have much better treatments these days. For those who can take it, Allopurinol is at least partially effective in nearly every case. The fact that the 19th century English would exaggerate the prevalence of a chronic, painful disease and that the 20th century Californians would exaggerate their physical attractiveness probably says something deep about national character. I expect it was probably less common in real life than in literature (it was an excellent reason for an author to send a literary character to Bath), but if there is an entire 19th furniture genre (the gout stool) devoted to the relief of gout sufferers, gout had to have been viewed as common or it wouldn’t have been worthwhile to create such a specialized piece of furniture. There aren’t many conditions that I can think of that still get a definite article ever. What about the clap? Or, in certain sub-cultures, the gay? At least, in certain other sub-cultures. I knew once what the prevalence of gout is, but anyway it is pretty common in the US — ie, every GP has many cases under them and knows exactly what to prescribe without thinking. More common than earlier, because of increased longevity. The issue is that gout is stunningly painful and disabling — having a serious attack is like having your toe on fire constantly for days, and you cannot do much of anything. Allopurinol and endomethicyn (sp?) make a huge difference, so that far fewer people than before get regular attacks, and can usually do something to relieve them pretty quickly when they do. If they have access to a primary care physician, that is. I’m not looking forward to being old with it though. Still pneumonia’ll probably get me before it gets intolerable. “The” is an englishism as in “the flu” and “the hospital”. I think “the flu” and “the clap” are both good examples of what I was thinking about. Nobody says, to stick to the G rated conditions, “the influenza,” so maybe it is a formal/informal thing. But, “the flu” isn’t limited to the English. Gout is a good disease for doctors. Chronic, occurs in patients who can usually pay*, hard to kill somebody through an error or omission, relatively straight-forward symptoms, relatively set options for treatment, and people usually get much better soon enough to be happy about the treatment. *The Medicare set is where it gets really common. Actually, if I’m not mistaken, “in hospital” (He’s in hospital) is the English version, whereas “in the hospital” is American (She’s in the hospital). I remember running across this issue when I was teaching EFL out of Cambridge materials. I think the usage of “in hospital” is parallel to the American usage of “in school.” “She is in school” means that she is at the school where she usually goes, while “she is in the school” does not necessarily carry that meaning. I’m not sure what “in hospital” implies to English people, but “in the hospital” usually suggests that the person is a patient. You say “the doctor is at the hospital” and “the patient is in the hospital,” but we are drifting toward prepositions. That was very pedantic. Sorry! If I am very good, I hope never to have to teach articles again, particularly not to native speakers of languages who have no articles at all. Amy –you’re right. The pain is making me lose my mind….